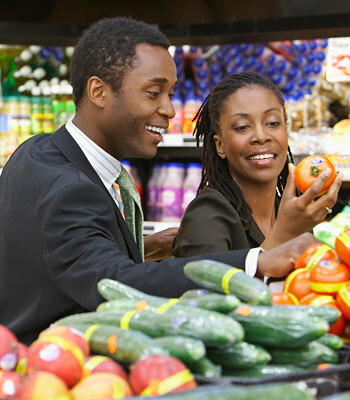 You probably already realize that maintaining a balanced diet offers a host of benefits to your overall health. But did you know diet also directly affects the health of your teeth and gums? It all starts before birth, as a baby's teeth begin forming in the sixth week of pregnancy and mineralizing in the third or fourth month. During this time, an expectant mother needs to take in lots of calcium (the major component of teeth) along with vitamin D, phosphorous and protein. Dairy products including milk, cheese, and yogurt have all of these. Broccoli and kale also have calcium, while meats are good sources of protein and phosphorous. These foods are also important for children, whose teeth continue to develop and mineralize through the teen years. Throughout life, oral tissues are constantly recycling; they need a variety of nutrients to support this process. It's equally important to recognize that nutritional deficiencies — a particular concern among older adults who have lost teeth — can reduce resistance to disease and hinder your ability to fight infection. Studies have consistently found that a high intake of fruits and vegetables reduces the risk for oral cancer — as well as other types of cancer. That's why eating a nutritious diet is important for oral health — as well as general health — at any age. Variety. No single food can meet all of the daily nutrient requirements. Eating lots of different foods also makes meals more interesting. Moderation. Don't supersize it. Foods and beverages should be consumed in serving sizes that are appropriate to meet energy needs while controlling calories, fat, cholesterol, sodium, and — particularly important in the dental arena — sugar. 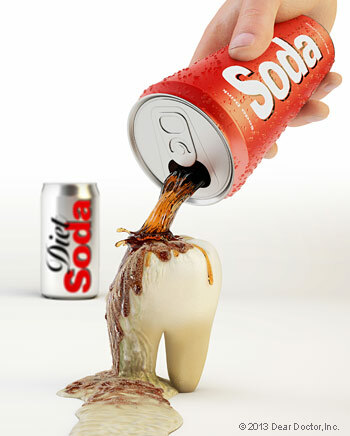 Your diet (which includes what you drink) plays a major role in tooth decay and enamel erosion. Your mouth is naturally hospitable to all kinds of bacteria. Some of these microorganisms are helpful and some are harmful, and many of the harmful ones thrive on a steady supply of sugar. As they process sugar from your diet, these bacteria produce acids that can eat into the enamel of your teeth, forming small holes called cavities. If left untreated, tooth decay can worsen, become quite painful, and threaten the survival of teeth. That's why it is important to avoid food and drinks with added sugar. If you have a sugar craving (and we all do from time to time), choose fresh fruit or yogurt instead of a donut or candy bar. Fortunately, there is no evidence that sugars in whole grain foods, whole fruits and vegetables, and in starch-rich staple foods like bread, rice and potatoes are harmful to teeth. Soft drinks, however, are a double whammy for teeth; many not only contain lots of sugar — up to 10 teaspoons per 12-ounce can — but they are also highly acidic. This means they erode teeth on contact, even before the bacteria in your mouth have processed the sugar these drinks contain. But even if they are sugar-free, the acid can still harm your teeth. So it might be best to avoid soda, sports drinks, energy drinks and canned iced tea. If you do occasionally have a soda, swish some water in your mouth afterwards — but don't brush your teeth for at least an hour! Doing so could make it easy for tooth enamel, already softened up by acid, to be eroded away by brushing. Drinking lots of water can help you maintain a healthy supply of saliva, which protects teeth by neutralizing acid. You can also neutralize the acid in your mouth after a sugary snack by following it up with a piece of cheese. Finally, remember that it's not just what you eat that affects the level of acidity in your mouth — it's also when. Snacking throughout the day, especially on chips, crackers, cookies or candy, means that your saliva never gets the chance to neutralize the harmful acids being produced. So if you eat sweets, do it only at mealtimes. As an added incentive, you may find this helps you maintain a healthy weight, too!